WebMedjugorje is a company that manages web sites www.webMedjugorje.com , www.medjugorje.pro and www.shop.webMedjugorje.com . Our company is based in Mostar, capital of Herzegovina area in Bosnia and Herzegovina, only 20 km from Medjugorje. Our company is specialized for the production of worship and religious souvenirs. All items present on the web sites www.webMedjugorje.com, www.medjugorje.pro and www.shop.webMedjugorje.com come from Medjugorje, where they are sold to pilgrims who come to the village of Blessed Virgin Mary. 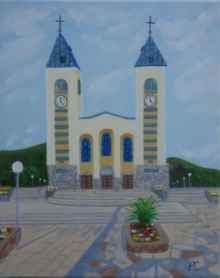 Our shop is located in the center of Medjugorje, only some meters away from St. James Church. When in The Holy Place, do not hesitate to visit our friendly staff who will help you with everything you might be interested in during your stay in Medjugorje. We offer these items to people throughout the world who are unable to make the trip to Medjugorje but who wish through purchase of genuine souvenirs from Medjugorje to celebrate their faith in Blessed Virgin Mary and feel the hope that every item from this holy place brings to one's life and home. If you cannot find an item that you are interested in, please send us an email and we will try to get it for you. All suggestions and comments are also welcome. Please note that our selection contains only quality articles that you can find in local shops in Medjugorje. By offering genuine souvenirs from Medjugorje we want to bring to our visitors at least a fraction of a magical feeling that every visit to Medjugorje brings. We continually update our web site with new items and special promotional offers to our customers. We also update free sections of our web site where we offer new photos and wallpapers that are free to our customers. Hoping you'll enjoy frequent visits to web sites www.webMedjugorje.com, www.medjugorje.pro and www.shop.webMedjugorje.com, we thank you for visiting our web sites.